The New Truma Caravan Mover XT range - manoeuvring with pin point accuracy. Proven products available since 2006. Smooth starting and stopping with Truma's Durasoft drive. All Mover models are amongst the lightest in their class. 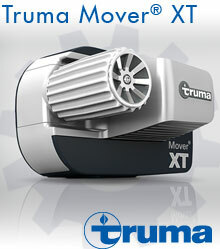 Truma Trumove range has 5 year warranty as standard and an increase in power. Mover XT models lighter and more powerful than their predecessors. The Truma Mover® XT2 for twin axle caravans. 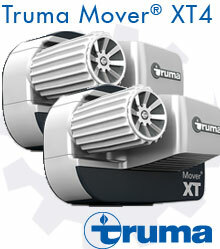 The Truma Mover® XT4 all wheel drive for twin axle caravans. Truma was founded over 50 years ago in Germany, and is now established as a major player in the UK leisure market. Truma has built a reputation for producing innovative new products, which make life away from home, feel like 'home from home'. Now an internationally recognised brand leader, Truma's range of products has grown to include high quality warm air systems, storage water heaters, lamps, pressure regulators and an extensive selection of accessories. Not to mention Air Conditioning and Caravan Movers. From Truma's large, modern production facility and warehouse based at Dove Valley Park, Derbyshire they operate a dealer supply and support network that is second to none, offering prompt technical advice and information on the latest techniques and new products. Truma's UK distribution and training ensures a rapid parts distribution service to all parts of the UK. 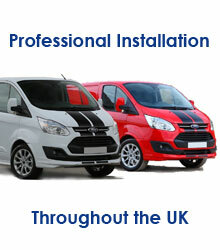 And is also home to a purpose built caravan and motorhome service bay. Truma understands that leisure time is some of the most memorable time that we spend in our lives. They believe in their role of creating efficient, high quality products that make that time as comfortable as possible, meeting the demands of your leisure lifestyle whether it's a weekend at the lakes, or two weeks on the continent. All Truma products are developed to the highest standards meeting the requirements of ISO 9001 for design and manufacture. Continued investment into product development ensures that Truma products are the best available.